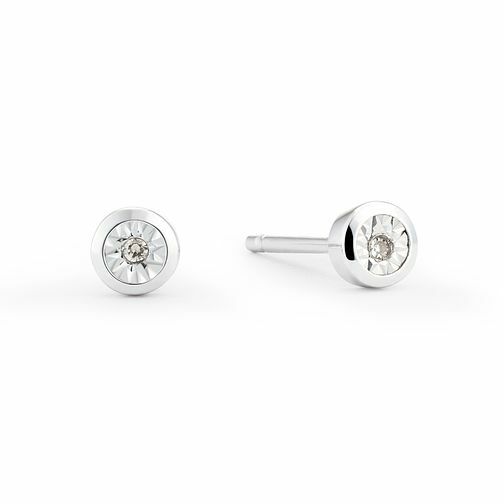 Go for laid back sparkling style with these chic 9ct white gold illusion set diamond stud earrings. A gorgeous gift or well earned treat. 9ct White Gold Illusion Set Diamond Rub Over Stud Earrings is rated 4.7 out of 5 by 19. Rated 5 out of 5 by Anonymous from Simple and Elegant I love this earings so much... . Very simple but elegant. It is a tiny piece of jewelry but it stands out in your ear. That makes it more beautiful. Just what I wanted. Rated 5 out of 5 by Anonymous from Beautiful product I brought this as a gift for my mum, she absolutly loves them and has said that she never noticed that they were in. They are a lovely subtle diamond design and are perfect for her as she likes smaller earings in general.